By means of polarization measurements UV, IR, and weight loss study, it has been detected that the extract of Asparagus racemosus leaves can act as corrosion inhibitor for the sake of mild steel in 8% H2SO4 solution. These plants show good inhibition efficiency at particular concentrations of the acid. It is observed that plants extract act as better inhibitor on increasing their concentration. Here we have focused on the corrosion inhibition action of different plant extracts in H2SO4 medium. From last few decades, corrosion inhibitor has been a colorable field of research. Acids are being used widely in the field of mild steel machinery in industries for different applications for e.g. cleaning, descaling, pickling etc. . To prevent the corrosion of mild steel by using plant extracts is one of the most enterprising methods. Several organic inhibitors are dynamically used to prevent corrosion and it is the most provident method. The inhibition action of organic inhibitors relies on their adsorption capability on metal by replacing water molecules . Organic compounds also show corrosion inhibition efficiency and there are several organic compounds which are notified to prevent corrosion [3-7]. But the problem with them is that they are extremely poisonous to both humanitarian as well as surroundings. Because of the poisonous effects of these organic inhibitors, natural nontoxic inhibitors are the requirement of our environment . Compounds which contain oxygen and nitrogen inhibit the corrosion of mild steel most effectually . In green inhibitors, secondary metabolize O and N are usually present and they are the active centers for adsorption [9,10]. The adsorption of green inhibitors on the steel surface can be either in the form of physisorption or chemisorptions or it may also be as a combined effect of both . Therefore, to overcome the toxic effect of commercial inhibitors, the development of natural nontoxic inhibitors to prevent the metallic corrosion is necessary and seductive . Extract of naturalistic products contain many compounds which are biodegradable in nature. Here we have used the extracts of Asparagus racemosus with H2SO4 which play an effective role to prevent corrosion of mild steel. The extract of Asparagus racemosus consists of Saponins alkaloid (Figure 1). The inhibition effect of this plant extract on the corrosion rate of mild steel in 8% H2SO4 was studied by using weight loss study, IR, UV and polarization measurements. Figure 1: Saponins: Chemical constituent of Asparagus racemosus. The very first, we collected the plants mentioned above for our study, then dried and powered. The powder was soaked into 500 ml deionized water and then refluxed for 5 h. In this manner, we obtained the aqueous solution which was then filtered and concentrated to 100 ml with the help of soxhlet apparatus. Then we prepared the solutions of particular concentrations with the help of this concentrated solution. Where, wi and w0 are the weight loss values in presence and absence of inhibitor, respectively. Electrochemical studies were conducted by using a Gamry interface Potentiostat/Galvanostate/ZRA0300. All techniques were useful. Polarization with Potentiostat measures current while on the other hand polarization with Galvanostate measures potential. The corrosion cell consists of three electrodes. We used saturated calomel electrode in the form of reference electrode, a platinum foil in the form of counter electrode and mild steel was used in the form of a working electrode. Here, we immersed the working electrode in the test solution and stabilized it for 30 minutes. With the help of such studies, we obtained Tafel polarization curves which helped us to get information about corrosion inhibition of mild steel. These slopes provided us the value of corrosion current densities ( Icorr), we used this value in the following formula and found the inhibition efficiency. Where Iicorr and Iicorr represent the corrosion current density values without and with inhibitor, respectively. We subjected the 8% H2SO4 solution saturated with extract before and after dipping the mild steel strips to UV-Visible spectrophotometer. We obtained the UV-visible absorption spectra for various concentrations of extracts before and after dipping the mild steel strips. The spectra of extract before dipping the mild steel strip showed some smaller peaks which were not found in the spectra of extract after dipping the mild steel strip. It means that when we dip mild steel strip in the extract, some molecules get adsorbed on the mild steel surface. They form a protective film on the surface and prevent the corrosion of mild steel. The IR spectroscopy tells us about different types of functional groups, heteroatoms present in the extract. The SEM micrographs of mild steel samples were immersed in 8% H2SO4 solution for 3 h in the absence and presence of extract. A rough surface can be seen for the mild steel immersed in H2SO4 without inhibitor which indicates the corrosion on mild steel surface in acidic medium. In the presence of inhibitor, a smooth surface can be observed, which indicates that inhibitor covers the mild steel surface. IR study tells about the functional groups present in the extract. From the IR spectra of Asparagus racemosus, the peak at 3454 cm-1 suggests O-H stretching of alcohol, the peak at 1639 cm-1 suggests C=O stretching of amide. Further peak at 1057 cm-1 suggests C-O stretching of alcohol. The IR spectr of Asparagus racemosus are shown in Figure 2. 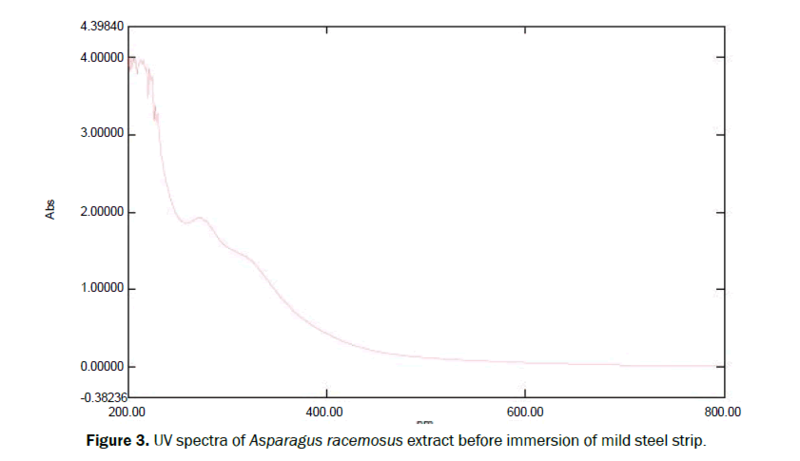 Figure 2: IR spectra of Asparagus racemosus. The UV spectra of Asparagus racemosus extract saturated with 8% H2SO4 before and after dipping the mild steel strips are shown in the Figures 3 and 4. Figure 3: UV spectra of Asparagus racemosus extract before immersion of mild steel strip. Figure 4: UV spectra of Asparagus racemosus extract after immersion of mild steel strip. For mild steel, the weight loss results in the absence and presence of different concentration of Asparagus racemosus extract saturated with H2SO4are summarized in Table 1. The Table 1 clearly indicates that when concentrations of the Murraya koenigii extract increases, the inhibition efficiency also enhances. 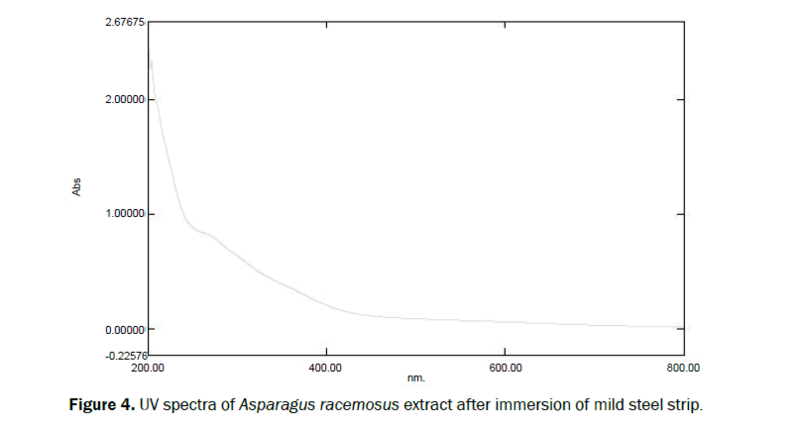 The Asparagus racemosus extract gives maximum inhibition efficiency of 77% at 300 ppm. Asparagus racemosus consist of heteroatoms (O, N) which form the metal complex bond with the metal surface thereby reducing corrosion. Table 1. Corrosion parameters for mild steel in 8% H2SO4 without and with various concentrations of Asparagus racemosus. Weight loss study was verified by polarization measurement. The polarization measurement for Asparagus racemosus provided the values of corrosion current density ( I0corr ) which has been shown in Table 2. Table 2. Potentiodynamic polarization parameters for the corrosion of mild steel in 8% H2SO4 without and with different concentrations of extract. We used these values in the following formula and will find inhibition efficiency. Where Iicorr and Iicorr represents the corrosion current density values without and with inhibitor, respectively. Figures 5 and 6 represent the polarization curves of mild steel in 8% H2SO4 without and with various concentrations of Asparagus racemosus extract respectively. Figure 5: Tafel polarization curves for mild steel in 8% H2SO4 without Asparagus racemosus extract. The Figure 7 shows the SEM micrographs of mild steel strips immersed in 8% H2SO4 without and with Asparagus racemosus inhibitor respectively. Figure 7: SEM images of mild steel in 8% H2SO4 without [a] and with Asparagus racemosus and inhibitor [b]. In the present study, the plant extracts which we used to determine the corrosion inhibition action of plant extracts for mild steel, contain alkaloids. These alkaloids are rich in heteroatoms like N, O. From the IR study of plant extracts, it has been shown that they contain functional groups like hydroxyl group, amide group, carbonyl group etc. Hence, the IR study also verifies the presence of heteroatoms N, O in the extract. These heteroatoms donate their lone pair of electron to the empty d-orbital of Fe. Similarly, there is also the interaction between the Π electrons of C=O and empty d-orbital of Fe. In such a way, the inhibitor gets adsorbed on the mild steel surface and forms a protective thin film by the combination between inhibitor and mild steel surface. This protective film prevents the corrosion of mild steel (Figure 8). Figure 8: Mechanism of action. Authors gratefully acknowledge Dr. R. Jayaganthan, Department of Metallurgical and Materials Engineering, IIT Roorkee, Uttrakhand, India for provide lab facility for our study. Quraishi MA, et al. Green approach to corrosion inhibition of mild steel in hydrochloric acid and sulphuric acid solutions by the extract of Murraya koenigii leaves. Mater Chem Phys. 2010;122:114-122. Fouda AS, Ellithy AS. Inhibition effect of 4-phenylthiazole derivatives on corrosion of 304L stainless steel in HCl solution. Corros Sci. 2009;51:868-875. 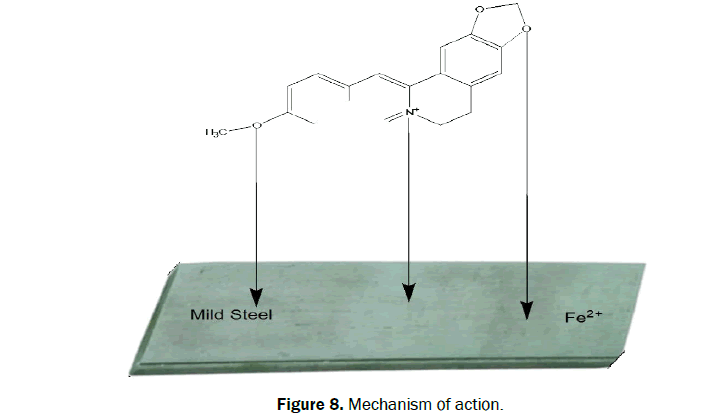 Quraishi MA, Sardar R. Dithiazolidines-A New Class of Heterocyclic Inhibitors for Prevention of Mild Steel Corrosion in Hydrochloric Acid Solution. 2002;58:103-107. Abd El-Lateef HM, et al. Corrosion inhibition of low carbon steel in CO2-saturated solution using Anionic surfactant. Adv Appl Sci Res. 2012;3:1185-1201. Lebrini M, et al. Electrochemical and quantum chemical studies of new thiadiazole derivatives adsorption on mild steel in normal hydrochloric acid medium. Corros Sci. 2005;47:485- 505. Bentiss F, et al. Appl Surf Sci. 2007;253:3696. Husnu G, Ibrahim SH. Ind Eng Chem Res. 2012;51:785. Yadav DK, et al. Electrochemical behavior of steel/acid interface: adsorption and inhibition effect of oligomeric aniline. RSC Adv. 2013;3:632- 646. Ji G, et al. Inhibitive Effect of Chlorophytum borivilianum Root Extract on Mild Steel Corrosion in HCl and H2SO4 Solutions. Ind Eng Chem Res. 2013;52:10673-10681. Larabi L, et al. Prog Org Coat. 2005;54:256. Aljourani J, et al. Benzimidazole and its derivatives as corrosion inhibitors for mild steel in 1 M HCl solution. Corros Sci. 2009;51:1836- 1843. Ashassi-Sorkhabi H, et al. EN, EIS and polarization studies to evaluate the inhibition effect of 3H-phenothiazin-3-one, 7-dimethylamin on mild steel corrosion in 1M HCl solution. Corros Sci. 2008;50:3363- 3370. Singh AK, Quraishi MA. Effect of Cefazolin on the corrosion of mild steel in HCl solution. Corros Sci. 2010;52:152-160.